Among my mother’s lesser known works are several allegories. An allegory is a work of art, in this case a painting, with a hidden meaning. Such pieces are common in art history; for example, Michelangelo’s sculpture of Night personified. At one time, Charlotte did several designs for use on china plates, showing the four seasons. Above, you see Spring. There was another version of Spring, never used, that had blooming bridal veil vines for hair. 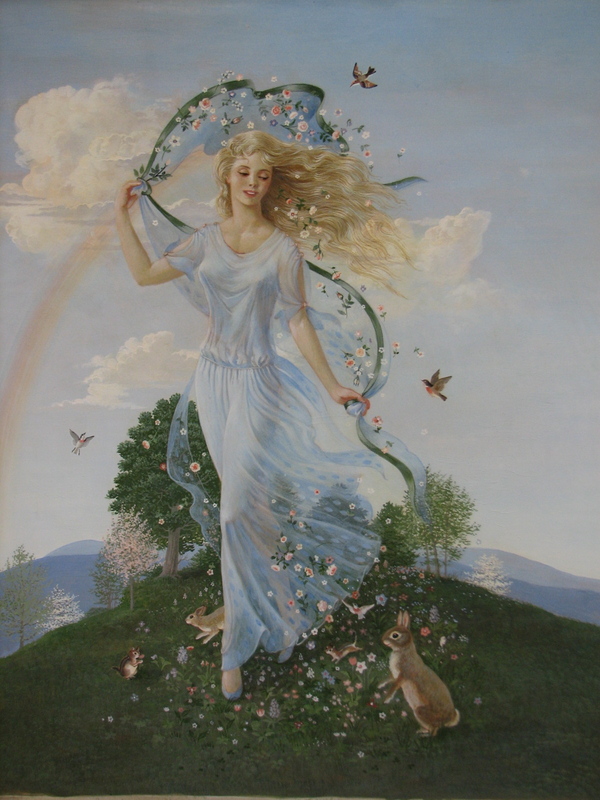 As in Botticelli’s Venus, flowers follow the figure, and little animals rejoice at Spring’s coming. Not far away in real life! I’m in love with the picture that’s fairly monotone with just a touch of light blue-it speaks novels to me! You are doing real well with the site. It looks great!